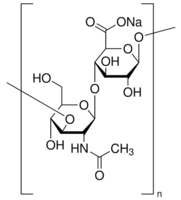 Sodium hyaluronate is an anionic, nonsulfated glycosaminoglycan distributed widely throughout connective, epithelial, and neural tissues. The average 70 kg (154 lbs) person has roughly 15 g of sodium hyaluronate in the body, one-third of which is turned over (degraded and synthesized) every day. Sodium hyaluronate is also a component of the group A streptococcal extracellular capsule. Sodium hyaluronate is used in eye surgery i.e., corneal transplantation, cataract surgery, glaucoma surgery, surgery to repair retinal detachment and. Sodium Hyaluronate, Eye drop Specification (Below) . Cosmetic and injection grade is also available.